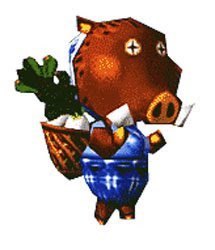 A quick preface for the uninitiated: Nintendo’s Animal Crossing is a game in which you, a human, move into and proceed to customize a small town populated by animals. I have the Wii version of this game and enjoy it as an occasional respite from what I do during my non video gaming hours, real-life simulator though Animal Crossing might be. I’m not yet sure if my embarrassment at not realizing this sooner outweighs my delight at finally decoding this particular pun. Her name also sounds like sojourner and she's always traveling. There more here. 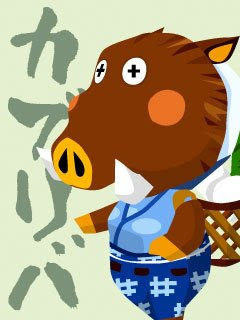 "Kabu", written in two different ways, means both "stock" (as in "stock market") and "turnip". I always thought "stalk market" was just as brilliant as "Sow Joan". Another "aha" that just came to me (after playing the DS game every single day for almost two years now): the currency, Bells. In Japanese, again written in two different ways, "kane" can mean "money" (usually with the honorific, "okane") or "bell". This came up in Harvest Moon on the SNES, where a shady peddler's promised "money tree" turned out to be a less exciting bell tree instead. In Japanese, it worked.